We may be in the depths of Fashion Month as we speak, but lest we forget, it’s Awards Season! That time of year when celebs treat us to a bit of old Hollywood glamour on the various red carpets of the world, we’ve already had the Grammys and the Baftas, and of course the Oscars are yet to come. So I thought it only right to pay tribute this week to one the planet’s finest red carpet makeup artists, the legend in the field that is Mary Greenwell. With over 25 years in the industry, and a client list stretching from Princess Diana to Cate Blanchett, Greenwell is one classy lady and her client list and makeup style fully attest to that. Her looks, across red carpet and editorial somehow manage to be classic and contemporary at the same time, and are always 100% flawless. She often turns out naturally glowing red carpet beauties but also loves to use colour in a soft, elegant way, never overpowering the the natural beauty of the wearer. Happily playing up both eyes and lips at times, she always manages to keep strong makeup effortlessly chic – something that many of us have struggled with over the years! Perhaps the most impressive element of the work of red carpet specialists (such as two of Mary’s old assistants, a pair of little known makeup artists by the names of Lisa Eldridge and Charlotte Tilbury anyone?! ), is that unlike in the world of editorial and advertising, or even movies and music videos where things can be retouched or lit to perfection, on the red carpet there is no room for error. Your makeup will be shot in hi-res, with blinding lights flashing, and within minutes those unretouched images will be being shared and analysed the world over. Because of this I actually completely relearned my approach to red carpet skin recently after seeing a video of Mary’s go-to technique. That wisp of concealer and illuminating moisturiser that’s so beautiful for editorial just doesn’t cut it here, you need coverage, intelligently applied, and a velvet finish to the skin. Watching Mary work in a very generous amount of foundation to the face with her fingers goes against my usual less is more approach, but her technique allows the product to melt seamlessly in. See it for yourself here. God bless you Mary, it was a life changer for me that one! As with many of the world’s greatest, Mary never set out intending to be a makeup artist at all. “I was so lucky,” she says, “I was one of those people who had no idea what I wanted to do. I was terribly confused, desperately shy, not at all confident…” Her foray into makeup started by chance when she moved from England to Los Angeles at age 18, and whilst working in a restaurant a friend told her of a job opening, working the makeup counter for new brand Il Makiage. She trained with, and went on to assist the brand’s owner Ilana Harkavi, a widely respected makeup artist herself, before moving to New York, and the rest is history. “That was the most exciting makeup range in New York at the time and put me in the right place for the advent of the supermodel,” she explains. A further defining moment in an already dazzling career came when the then editor of British Vogue introduced her to Diana, Princess of Wales. Mary helped to redefine Diana’s image, stripping her of her beloved blue eyeliner and replacing it with a more contemporary, clean look. Diana loved the change and Mary went on to work on some of her most iconic shoots. “Diana was always very open and willing with her style. I think as soon as we worked together she realized the power of hair and makeup, and that is something that should never be underestimated.” Mary has since continued to be the must have makeup artist for the World’s A-List celebrities and travels the world to make up clients such as Cate Blanchett, Jessica Chastain, Amanda Seyfried and Uma Thurman. And then, to top it all off, Mary has somehow found the time to create one of the most delicious range of perfumes known to man. 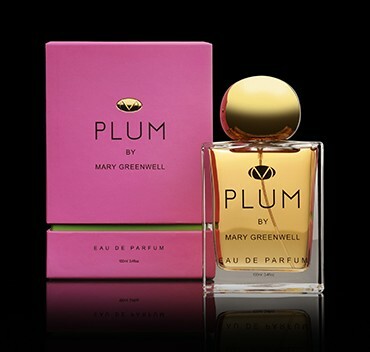 Plum by Mary Greenwell is one of my current absolute favourites and stands alongside her other gorgeous creations in Cherry, Fire and Lemon, which have proved to be very successful in their own right (and I have heard will evolve into beauty products – pretty please!). Her lifelong love of fragrance lead her away from coming straight out with a cosmetics line, and going for something “a little more unusual”. I was once told – and I don’t know how much truth there is in this (but I hope it’s true as it’s so lovely) – that being such a lover of fragrance she spritzes models and actresses with favourite, personally selected scents to finish a makeup look before they go on set. So, if Mary doesn’t inspire you to want a little of that modern glamour in your own makeup arsenal the I don’t know what will. Take a look at her videos on YouTube with Get The Gloss and Marks and Spencer, they’re all effortless and utterly gorgeous and full of great techniques and inspiration. If I were you I’d devour as many as you can! And don’t forget to set aside 35 mins to really send yourself mad with this look inside her pro kit with Sali Hughes. Kit envy anyone? So that’s what it takes to make such beautiful red carpet looks… That and a touch of Mary’s makeup genius I guess. I for one cannot WAIT to see the beauties she sends down the Oscars red carpet this year. Thanks for all the makeup inspo Mary! Waterproof Mascara – Is It Really Better?